Influence in the Principate Era was almost overwhelmingly the result of birth or wealth. Most notable figures were related to members of the senatorial or indeed imperial ranks. Several women were able to obtain positions of power, most notably Agrippina the Younger, the mother of Nero, even if their power was often as precarious as that of their male counterparts. With birth came lands across the empire and thus wealth, but some individuals did manage to build up wealthy within their lifetime, such as Epaphroditus. Furthermore, many chiefs and leaders of Rome’s enemies were able to rise to positions of political significance, being well educated themselves, often within the empire itself. Arminius was born in Germania in 17 BC. He hailed from Germanic elites but was educated in the Roman army and even lived as a hostage in Rome. At some point he became a Roman citizen at the equestrian rank, but he left the Roman world behind him to return to the place of his birth and fight the Romans. In 4 AD, Arminius took command of a detachment of auxiliary forces during fighting on the Balkan peninsula. From this position, Arminius began to unite various German tribes ultimately bringing a revolt to northern Germany in 9 AD. Somewhere in the Teutoburg forest, Arminius led an ambush against the three legions of the Roman commander Varus. Arminius’ forces proved a success and 20,000 Roman soldiers were slaughtered, with Varus himself committing suicide and three legions eagles being captured. By driving the Romans out of Germany Arminius won one of the most substantial defeats ever over the Roman army. Because of this Arminius’ actions could not go unchecked. In 14 AD, general Germanicus launched a series of assaults on Arminius, defeating him twice. As the Roman pressure began to tell Arminius began to lose the support of other German nobles including his father-in-law, who felt that the Roman empire need not be resisted. The romans continued to fight Arminius until they had regained two of their legion eagles, before keeping Arminius north of the Rhine. Despite leading to an end to the fight against the Romans, Arminius found himself immediately in conflict with the Marcomanni tribes. In 21 AD, Armimius was murdered by his own troops who were concerned that he was becoming a megalomaniac. In spite of the manner of his death, the Romans failed to push deeper into Germania and Arminius was largely responsible for that. In the nineteenth century, during the unification of Germany under Bismarck, many propaganda merchants turned to Arminius’ as a figure of German unity. Boudica was born in the first century AD in Britannia. She hailed from royal stock and her husband, Prasutagus was king of the Iceni. The Iceni were initially separate from Roman Britain, but Prasugatus was ambitious and thought that allying with the Romans would lead to his good fortune. It was understood that when Prasugatus died his lands would transfer to the Roman empire. Given that Prasugatus had only two daughters and no mail heir, the succession was considered a formality. When Prasugatus died in 60 AD, the Romans moved in and immediately sought to extract finance from the region. This led to an uprising and Prasugatus’ widow, Boudica, was chosen as the leader. The rebellion soon picked up pace with the destruction of the Roman town of Camulodunum. The governor of Britain, Suetonius was in Londinum but abandoned the settlement to the rebels who burnt it down. The rebels then moved on to destroy Verulamium. At each town, the rebels systematically destroyed both property and life. After Verulamium, Suetonius regrouped and gathered a stronger force of ten thousand men, even though this paled in comparison with Boudica’s force of over two hundred thousand. The battle, however, did not go favourable for Boudica’s forces, who were not as well trained or equipped as the Romans. Using javelins, the Romans destroyed many of the British forces whose retreat was blocked by their own campaign flotilla. Over eighty thousand Britons died and Boudica committed suicide with poison. Gnaeus Julius Agricola was born in Gallia Narbonensis on the 13th of June 40 AD. He was of Senatorial stock and was educated in rhetoric and philosophy as a young man. He entered the Roman army as a tribune in 58 AD, serving first in Britain where he participated in the suppression of Boudica’s uprising of 61 AD. When Vespasianw as elected to emperor in 68 AD, Agricola was made governor of Britain where he swiftly moved to re-establish law and order after years of fractious rebellion. Agricola also campaigned in Caledonia and Ireland. He finally left Britain in 85 AD and returned to Rome where his military successes were honoured. In 90 AD he declined the governorship of Africa because of poor health and high finally died on his family estate in 93 AD. Decebalus was born in the first century AD in Dacia. He rose to positions of power in the court of the Dacian king Duras who from 85 AD were engaged on systematic raids of the Roman province of Moesia. By 86 AD, the Romans, under Domitian had pushed the Dacian troops back, but under Decebalus’ control two Roman legions were ambushed and slaughtered on the Tapae pass. This success forced Duras to abdicate and Decebalus was crowned king of Dacia. Decebalus had shrewd military understanding and was an expert at organizing ambushes. Such was his success that Domitian was forced to agree peace terms with Decebalus in 87 AD. Decebalus moved quickly to centralize the governance of Dacia as well as building alliances with other tribes north of the Danube. In 101 AD, the new emperor Trajan launched an assault on Dacia. Decebalus suffered defeat at the battle of adamclisi and was forced to give up territory to the Romans. This did not please Decebalus. His first move was to take revenge on those tribes that had supported the Romans, then, in 105 AD, he launched a direct assault on the Romans, using guerrilla tactics to infiltrate the emperor’s own camp where he captured Pompeius Longius a senior officer in Trajan’s army. The success, however, was short lived. Trajan was furious and launched a huge assault on the Dacian capital, Sarmizegetusa, where after a siege, the Romans prevailed. Decebalus managed to escape with his family but by this point many Roman detachments were out searching for him. To avoid the humiliation of capture and execution, Decebalus committed suicide by cutting his own throat, as depicted on Trajan’s column. Decebalus’ head was taken by Roman troops who presented it to Trajan. Claudia Octavia was born in Rome in 39 AD. She was the only daughter of Emperor Claudius and as a young girl she was betrothed to the praetor Lucius Junius Silanus Torquatus. This marriage never took place, however, as Octavia’s cousin, Agrippina the Younger, persuaded Claudius to adopt Nero as his heir and marry Nero to Octavia. When Claudius was poisoned in 54 AD, Octavia became empress alongside her husband Nero. Octavia found herself between her husband, Nero, and his mother, who embarked on a power struggle that only ended when Nero killed her in 59 AD. Octavia did not have a happy marriage and Nero soon grew bored of her, regularly attempting to kill her by strangulation, as well as having open affairs, first with Claudia Acte and then with Poppaea Sabina. When Sabina fell pregnant, Nero divorced Octavia claiming she was baron. Octavia was banished to the Island of Pandateria. Octavia’s treatment did not please the Roman people who protested against her treatment. Aware of the situation, Nero almost agreed to remarry Octavia, but he changed his mind and instead decided to have her executed. Octavia was found days later, with her veins open in the bath. Nero had her head severed and sent to Sabina. Germanicus Julius Caesar was born in Rome on the 24th of May, 15 BC. He was a relation of emperor Augustus and entered public life within the Roman military He was a hugely successful general and became a favourite of the emperor only to be overlooked for the imperial succession in favour of Tiberius. Instead Germanicus focused on the army. His most notable campaigns were in Germania where he won many victories and earned the name Germanicus. He was made consul in 12 AD and governor of the Germania Inferior in 14 AD. At one point his own soldiers tried to name him as emperor but Germanicus wisely put down this uprising and led campaigns against the German leader Arminius. 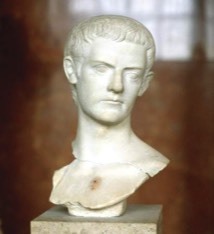 Emperor Tiberius, however, was growing concerned about Germanicus’ power and the loyalty of his troops. He moved him from Germania to Asia where he was placed in command of different legion and charged with the problem of the Cappadocia and Commagene kingdoms. Germanicus’ power was still conspicuous, even in this new environment and he fell ill under mysterious circumstances and died in Antioch in 19 AD. He was only 33 years old. The nature of Germanicus’ death and his widespread popularity especially with the legions, greatly harmed Emperor Tiberius’ popularity and left Rome gripped by suspicion and fear. Julia Agrippina, better known as Agrippina the Younger was born in Oppidum Ubiorum on the 7th of November 15 AD. She was the daughter of Agrippina the Elder and the Roman general, Germanicus. Emperor Caligula was her brother. She spent her early years on campaign with her father, but returned to Rome after her father’s suspicious death where she lived on the Palatine Hill. In 28 AD, she was engaged at the age of thirteen to Gnaeus Domitius Ahenobarbus who would later serve as consul in 32 AD. When Tiberius died in 37 AD, Agrippina’s brother, Caligula, became emperor. Later in the same year, Agrippina gave birth to Lucius Domitius Ahenobarbus, who would grow up to become Emperor Nero. In 39, Agrippina was involved in an unsuccessful plot to murder her brother Caligula who had gone mad due to his infatuation with Agrippina’s younger sister Drusilla. Agrippina was exiled for her part in the conspiracy but Caligula was murdered in 41 AD and Agrippina’s uncle, Claudius became emperor. Claudius’s appointment marked the end of Agrippina’s exile and she was reunited with her son, Nero. In 49 AD, after the death of his third wife, Emperor Claudius decided to marry Agrippina, his niece. The marriage was popular with the senate as it united the Julian and Claudian dynasties. From this point on Agrippina was determined to make her son, Nero, emperor. She moved fast to eradicate rivals and married her son to Claudia Octavia. She also removed anyone who showed any loyalty to Claudius’ previous wife, Messalina. In 50 AD, Agrippina was granted the title Augusta, the first woman to hold the title in the lifetime of her husband. Agrippina’ desire to have Nero emperor was secured when she manipulated Claudius to name him as his heir, even if Claudius later regretted this and indicated that he favoured Britannicus. Claudius’ change of heart was more than Agrippina could take and she poisoned him on the 13th of October, 54 AD, with a place of deadly mushrooms. Nero became emperor and his mother, Agrippina became a priestess of the cult of Claudius. She was also allowed to observe meetings of the senate from behind a curtain. Initially, Agrippina was able to control her son, but from the moment he abandoned his wife Octavia for the freedwoman Claudia Acte, he began to act independently. Agrippina first moved to support Britannicus as emperor, but he was poisoned on Nero’s orders and Agrippina was forced to deal solely with Nero. Nero took away many of her privileges and forced her out of the imperial palace to live in the riverside estate of Misenum. Now trying to marry his mistress Poppaea Sabina, Nero needed rid of his mother. He first tried to kill her in a ship that was designed to sink as soon as it entered open water, but Agrippina survived and swam to the shore. There she was killed by an assassin. Nero proclaimed that Agrippina had plotted to kill him and that she had committed suicide when the plot emerged. Her last words were, “Smith my womb.” On viewing the corpse, Nero declared how beautiful his mother was, in death and her body was cremated. Livia Drusilla was born in Rome on the 30th of January 58 BC. She was married to Tiberius Claudius Nero, a prominent politician in the first century BC. In 42 BC, she gave birth to a son who would be the future emperor Tiberius. After the civil war of the Triumvirate, Livia returned to Rome where she met Octavian in 39 BC. Octavian fell in love and despite each already being married, divorces were arranged and the couple married on the 17th of January 39 BC. Despite an at times tense and tumultuous marriage, they would stay married for 51 years. When Octavian became emperor Augustus in 27 BC, he and Livia ruled the roman empire. Livia took pains to dress with humility and Octavian allowed her to rule her own finances. When Augustus died in 14 AD, he left a third of his property to Livia and the rest to Tiberius. Livia was also given the title Augusta. At first Tiberius got along with Livia, but he soon came to resent the political status attached to her as the wife of Augustus. Such was her influence that Tiberius withdrew from Rome to Capri where he remained on news of her death, dispatching Caligula to speak at her funeral. Livia was ultimately deified by the senate, but not until thirteen years after her death, in the reign of her grandson, Claudius. Julia Domna was born in the second century AD to a Syrian family from the city of Emesa. Her family were from the royal family of Emesa, notorious for their worship of the sun god Elagabal. In 180 AD, Julia married Emperor Septimus Severus and they produced two sons, Caracalla and Geta in 188 and 189 AD respectively. Contrary to custom which normally saw wives rest in Rome, Julia accompanied her husband on campaign around the empire. When Severus died suddenly in Eboracum, Julia was there to mediate between Caracalla and Geta who had jointly inherited the empire. She convinced them not to separate the empire into two halves but was unable to prevent them continuing to dispute, and Geta was murdered by Caracalla’s soldiers whilst lying in his mother’s arms. Despite Geta’s death, Julia continued to support Caracalla and went with him on his Parthian campaign in 217 AD. When Caracalla was assassinated and succeeded by Macrinus, Julia committed suicide. She was later deified by the Senate. Lucius Pedanius Secundus was a wealthy Roman politician active in the 1st century AD under Emperor Claudius. In the year 43 AD he served as Consul from March until July. Later, in 56 AD he was appointed Praefectus urbi, the role of prefect of the city of Rome. The position saw him act as superintended for all guilds as well as being responsible for grain distribution. The cohorts urbane and the vigils were also placed under his command. Very little is known about his tenure as Praefectus, but he was murdered in 61 AD by one of his slaves. The Senate led by Gaius Cassius Longius subsequently demanded the execution of all 400 of Lucius’s household slaves as was dictated by Roman law. The common people opposed this punishment and demanded the release of the innocents but Emperor Nero used the army to keep order and the execution of the slaves went ahead. Epaphroditos was an ex-slave who rose to be secretary to Emperor Nero. He was freed by emperor Claudius and took on the role of Imperial secretary. He was required to draft responses to petitions on behalf of Nero. In 65 AD he learned that senator Gaius Calpumis Piso was plotting a coup. Epaphroditos reported the matter and Gaius was arrested. He rose to great wealth under Nero and owned a large house and garden on the Esquiline Hill east of the Domus Aurea. In 68 AD, he accompanied Nero on his flight and helped him to end his own life. This service to his mater ultimately cost him his own life after he was first banished and then executed by emperor Domitian who felt he should have attempted to save the life of Nero rather than assisted his suicide. Antonia Minor was the younger daughter of Mark Anthony and Octavia Minor and niece to Emperor Augustus. She was born in Athens and never knew her father who had divorced her mother in 32 BC and committed suicide in 30 BC. She inherited immense wealth including property in Italy, Greece and Egypt. She married the Roman general and consul Nero Claudius Drusus in 16 BC and had several children of which three survived. After Drusus’s death in 9 BC she was under pressure from her Uncle to marry again but refused to do so. Antonia is well known for exposing a plot by her daughter Livilla to murder the Emperor and seize the throne for the Praetorian prefect Sejanus. After the plot was discovered Sejanus was executed but Livilla was handed over to Antonia for punishment. She imprisoned Livilla in her room until she starved to death. Claudia Livia Julia, also known by her family nickname of Livilla, was the only daughter of Nero Claudius Drusus and Antonia Minor and sister of the Roman Emperor Claudius. She was a remarkably beautiful woman. Livilla was twice married, first in 1 BC to Augustus’ grandson, Gaius Caesar until he died in 4AD, then, that same year, to her cousin Drusus Julius Caesar, the son of Tiberius. Both her husbands were heirs to the imperial crown. Livilla later had an affair with the praetorian prefect Sejanus. In 23 AD Livilla’s husband Drusus was poisoned although no suspicion was aroused at the time. Sejanus set about trying to marry Livilla but in 31 AD the emperor Tiberius received evidence from Antonia Minor that Sejanus was planning to overthrow him. Sejanus was arrested and taken to prison where he was executed. Livilla was handed to her mother for treatment. She died in 31 AD as a result of being locked in her room by her mother. Agrippina was a member of the imperial family of Augustus and a wealthy and distinguished Roman woman. She married her second cousin Germanicus, a popular general and politician. Together they had nine children, six of whom survived into adulthood. Germanicus was poisoned in 19 AD. Agrippina took the matter before courts in Rome but was turned away. For the next ten years Agrippina lived in Rome. She became involved with groups of Roman senators opposed to the growing power of Sejanus. Her relationship with Tiberius was always difficult. In 29 AD she and her sons were arrested and on Tiberius’ orders she was banished to the island of Pandataria. In prison she was repeatedly flogged, on one occasion so badly that she lost an eye. Agrippina starved herself to death and died in 33 AD. Julia was the daughter of Gaius Julius Bassianus, priest of the sun god, Heliogabalus. She was among the most important women of her day. She was able to orchestrate the ascension of her Grandson Elagabalus to the imperial throne after establishing the rumour that he was Caracalla’s illegitimate son. Sadly, her teenage grandson was a disaster as emperor and soon became involved in sexual scandals including taking the liberty of marrying a Vestal Virgin. Julia thus decided to promote her other grandson, also 14, Alexander Severus. After convincing Elagabalus to adopt Alexander as his heir, he was murdered and thrown into then Tiber. Julia died in 226 and was deified. Julia was an influential Roman woman famed for her intellect as well as her political influence. She was the wife of Lucius Septimus Severus, Emperor, and the mother of Emperors Geta and Caracalla. She hailed from Syria and was the youngest daughter of high priest Bassianus. The family had immense wealth and Julia inherited several estates. She was happily married to the Emperor who cherished her wisdom. Julia personally protected philosophers and helped their schools flourish in Rome. When Severus died in 211, Julia mediated between her two sons who ruled as joint emperors. The two sons quarrelled however and Geta was murdered by Caracalla’s soldiers later that same year. Julia continued to stick by her son and when his campaign against the Parthian army ended in defeat and his death she chose to commit suicide. Herodus was Greek of Athenian descent but his family bore the Roman family name Claudius because a paternal ancestor received Roman citizenship from the Claudius family. Herodus spent his childhood between Greece and Italy and received education in rhetoric and philosophy. In 125 AD, Emperor Hadrian appointed him Prefect to the Roman Province of Asia. Later, in 143, he was appointed consul. Herodus controlled huge amounts of land including a large area on the Appian Way outside Rome. Of immense wealth he became a philanthropist and patron of public works including: a stadium in Athens, a theatre in Corinth, a stadium in Delphi, the baths at Thermopylae, aqueducts at Canusium in Italy and Alexandria Troas, a nymphaeum at Olympia and various benefactions to the people of Thessaly, Epirus, Euboea, Boeotia and Peloponnesus. On his death and in recognition of his generosity, the people of Athens gave him a lavish funeral that took place in the stadium that he himself had commissioned. He and his wife are commemorated in Herodou Attikou Street and Rigillis Street and Square in downtown Athens to this day.